Usually when I open a cookbook I skim through, look at the pictures (I know!) and then choose based on pictures and apparent ease and cost of recipe, what I am going to cook. I then turn down the corner of those pages and slowly over time I make most, if not all of those recipes. I tried to have that approach with Victuals but the writing drew me in more than most of the recipes. My husband and I ended up reading vast sections out loud to each other, the writing was so entertaining, engaging, and informative. Frankly it felt a bit like traveling to Appalachia but not as a tourist, but rather visiting a local friend. Which makes sense based on the subtitle: An Appalachian Journey With Recipes. If I had to just one section to read again it would be a hard fight between the Introduction, Roots and Seeds, and Preserving. The few recipes we made from the book were very good. We stuck mostly to the Apple-achia section of the book as our four apple trees were overwhelming us at the same time Victuals arrived on our doorstep. The apple butter was particularly good and easy to make, and a large amount of apples (thank goodness). I don’t know why the recipes didn’t engage me more. The pictures are very appealing and I am sure we will make more in the future, but after reading all the non recipe sections of the book (a good 1/2 of the book itself) only a few pages are dog eared. I think part of it is that I have never eaten very much of this kind of food before so I don’t know what to expect in terms of finished product. Even when it comes to apple butter, I had only had it once before hand, so it took us a while to get in the habit of using it, even though it was very good. I am planning to make my mother The Shack’s Sweet & Savory Banana Pudding and I am rather excited about trying it myself. I am sure I will make more of the recipes over time, but even if I don’t, I learned so much from this book already, and I enjoyed every minute I spent reading it. This year I have a very different plan for The Poetry Marathon. Usually I challenge myself to write poems of a certain length, but this year I am having a different approach. This may go well, or it may go horribly wrong. Jacob often tells writers that doing The Poetry Marathon is like writing a chapbook in a day, and it really is like that in some ways. Most chapbooks are not even 24 poems long. However my favorite chapbooks are always thematically linked. Most of the poems I write during the marathon having nothing in common with each other. That is about to change. This year all of my poems will be written about a theme, and connect directly to the title of the chapbook. The title of the chapbook and the theme is – The Ways We Go Missing. I am not going to reveal anymore about it before the marathon itself, but I am rather excited to start writing. Last year I did a half Marathon for the first time during The Poetry Marathon. I was seven or eight months pragnent at the time, so the full marathon was not logistically possible. Then for the very last hour of the half marathon I wrote a poem that is one of my personal favorite poems. This poem is named Salmon. Of course I still had to edit it a great deal and the version of Salmon I started out with after the marathon was very different than the one I submitted for publication. Salmon went on to be published in the 2016 spring issue of Tar River Poetry. from the sea and cannot be distilled into crystals. me to keep in the pit of stomach, besides yourself. and those doctors who can never agree. then give it away to theirs, with fear, with hope. I wrote this poem for my daughter June (although she was un-named at the time). The strange thing is that when I wrote it, I imagined her many years later trying salmon for the first time and plucking raspberries off the back fence. What I wrote has now come true, less than a year later. It turns out I didn’t know very much about babies and eating. June has now plucked raspberries from the bushes along the back fence (I did have to hold her there during the experience). 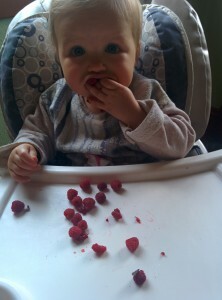 Although she largely eats raspberries I have picked. This is mostly because she does not pick nearly as fast as she wants to consume. She has also consumed salmon, raw and cooked. While she despises the cooked version (which I couldn’t handle while pregnant) she loves the very small sampling of raw salmon we have offered her. It feels wonderful to have written something that has come true, more or less. As you can see in the photograph below, she has very blue eyes. Also, she cannot roll them yet. Hopefully the “oh mother” years are a long way off. This essay (of sorts) is going to be flawed and incomplete. I am warning all readers of this in advance, so no one can complain at the end. I became a mother 9 months ago and because I am a planner I prepared for my daughter’s birth. Her nursery was already to go, as was my hospital bag, and a month worth of freezer meals. However some of the most important baby items, things I would rely on every day after her birth we had not even bought yet, because I a) did not know about them or b) thought we did not need them. This was one of the many ways I failed to be prepared for her arrival. Our life was changed completely. Jacob and I knew it would be changed, but we didn’t know how. And we still don’t know how it will change. For example one week June would wake up at six am, nurse and go back to sleep till nine. This gave us a lot of nice morning time. But it only lasted for a week or so. Then her schedule was completely different and we did not even realize it at first. We were shocked that she was up at seven and did not want to go back to bed. Before June was born I worked with Jacob running a web publishing company. I still do that. I also wrote a poem a day. I still do that too. In fact there are very few things I gave up, in terms of work and art. But I did give up a lot of other things. I still manage to write over an hour each day. I also still work on the publishing company the same amount I did before. So a reader may jump to one of many conclusions, most which are incorrect. One of the conclusions several people have jumped to is that my work is not actually work. Another mother, a stay at home mother, told me the other day that I was just like her, because working from home doesn’t count as working. But here is the thing, I spend a solid chunk of time every day doing something that does not involve June or chores. I spend this time working on concrete things that bring in income. If I stopped working that money would not be coming in. I also enjoy my work. But I didn’t say anything to this stay at home mom, because I think what she doing is important, wonderful, and also a lot of work, work that doesn’t earn her money, but helps her child, keeps her house clean, etc, etc. I was worried that anything I would say would make her feel devalued or misunderstood. When I mentioned before that I gave up a lot of things, this is what I mean by it. I gave up the sources of my sanity. The little pockets of emptiness in my days that helped me refuel. Casual wandering. Spontaneous dates. Spontaneous anything. Instead I do more and more things in smaller spaces in time. When before I might spend forty-five minutes cleaning the house, now I do that while taking care of June and handling phone calls. In everything I try to be as efficient as possible. The work I did in eight hours I now complete in four. All night I dream about squeezing more in. I sleep less. I have less time for it. In order to complete everything that I have to do, I have become harder on myself. Whenever I am only doing one thing, I chastise myself. Every time I sit down to read or even to eat I find myself questioning if I really have to do that. Recently I started writing a novel. I had an hour break away from June and I found myself writing. Later that same weekend I told a friend about the novel. He laughed at me when I told him about it, he said “So you will finish it 15 years from now?”. In the face of adversity, I tend to double down. It is a month later and I am on page 65. The novel might seem like I am ripping a hole in a ship during a storm (which is something that happens in the book), but instead of adding to the insanity, it is helping with it. It gave me something that is mine, and only mine. Something that I have not had since June’s birth. I don’t think there is any perfect way to be a mother. If I gave up work I would be around more for June, which would be great, but I would become a different person. Maybe that person would be a better mother for June, but probably not. Because of my work schedule I only regularly don’t take care of June for 16 hours a week. That still leaves a lot of June time. Still I am very aware of how lucky I am. When I go to work, it is a studio in our backyard. Janice, the person who takes care of June in my absence is a wonderful friend who loves June . Even though we live hours and states or countries away from most of our biological families we are part of a vibrant and caring community, but even with all that the last nine months have been hard. This is most likely something that will take me my whole life to figure out, and I am sure that once June is old enough to say complete sentences she will want to weigh in on it, but I know no matter what she says, or anyone else I am trying, and I am figuring things out. That each day she becomes less of a baby and more of a child, one that loves me already, even if she is still just figuring out how to kiss. Four years ago now, I came up with this crazy idea for a poetry marathon, a day when poets wrote 24 poems in 24 hours. I googled it to see if it already existed so that I could participate. Since google revealed nothing but poetry reading marathons, a different beast entirely, I told Jacob about my idea. I was going to do it on my personal blog. But Jacob really liked the idea, in fact he wanted to try it too. In fact he thought other people might want to as well. So he designed a basic site for it, and that summer we convinced a very small number of people to join us in this crazy scheme. Only one other person completed it, Melissa McCarter (and she wrote some terrific poems). Although others got awfully close. Based on the poems we wrote and published during that time, the second year was a lot easier sell. Writers were interested as they had seen that it had worked for others. However we skipped that summer, due largely in part to the fact that we had no fixed home base and things were chaotic, even without a marathon. However in the summer of 2014 we set a date and made it happen. This time over a hundred people attempted to complete either a half or whole marathon. It was a real experience. Jacob and I had no problem finding participants and we only had a small window of time when they could sign up. Part of that is because made there be a half marathon option. We did this because of popular demand, Not even is up to producing that many poems in a fixed amount of time or staying up all night (with naps, if you so choose). Each year I participated I learned something different. During the first year I learned that it was possible to complete a marathon while writing longer poems, as I challenged myself to always write at least 22 lines. I also learned how much mental energy and focus writing like that required. The next day I felt very drained, and could not even remember writing many of the poems. Right before we held the marathon in 2014, I did a solo marathon that spring. Jacob supported me but did not write. This was the least rewarding of any of the marathons, but I did learn that exercising between writing periods helped keep my energy and focus up. It was less rewarding in part because I was doing it alone. The 2014 marathon was the first one with a large number of participants from all over the world. There was a group facebook page where everyone could chat with one another. Also the main page during the marathon was constantly being updated with everyone’s new poems. It was really impressive and motivating. It really gave me energy to write new and compelling poems. Last year during the 2016 Poetry Marathon I was 7 and a half months pragnent. This time an even larger number of participants were involved. However well in advance of the marathon I realized that I could not compete in the full marathon, I would have to do a half marathon instead. I could not lose that much sleep while in the third trimester. I was disappointed initially to know that I was only going to do a half marathon when I knew I was capable of doing a full one. In fact I didn’t really prepare for the marathon like I usually do. I was not taking it seriously, up to the point where it was 6 am and I was writing the first poem. Suddenly I realized that I would only have 12 chances to produce a really good poem instead of the usual 24. I had to make every poem count. Usually I only spend 20-30 minutes on every poem. If one is awful I feel a little embarrassed posting it, but it feels unavoidable. During the half marathon I instead spent 30-40 minutes on almost every poem. I really focused on crafting good poems. If I didn’t like the poem I started I scrapped it before reaching the last line. Instead of thinking about conserving my energy so that I could continue going for 24 hours, I just focused on using the energy that I had and not thinking about the next hour or the next poem. I think I expanded as much energy and focus in 12 hours as I usually expanded in 24. In short it was a wonderful and exhausting experience. Next year I will most likely do the full marathon instead, but I will approach it with the same focus, the same willingness to use up all the energy I have on one poem. Humans dream again, repurpose a barn, carry light in their pockets. Maybe the god they waited for isn’t coming, but at least they are happy. The above quote is the last paragraph from a review of my chapbook Incident Reports. The review is thoughtful and very detail oriented. Jennifer MacBain-Stephens (who I do not know) manages to follow the narrative of Incident Reports closely and with much insight. The quoted paragraph is particularly apt, and captures something that I want readers to take away from the book as a whole. I am a person of faith. To be more specific, I am a Christian. Which means that some might find it strange that I wrote an intentionally non-biblical apocalypse. The vanishings in my poems are not the rapture. Long after the world has been permanently changed there is no God returning. But I do not think that this contradicts my faith at all, or is at odds with it in any way. When I was younger, the Left Behind series was extremely popular. I remember once, at 16, while hanging out on a porch with a few friends who were younger than I, one brought up the fact that we had not heard from our parents down by the dock for hours. He was in the midst of reading the Left Behind series, and he wondered if they had been taken, if the rapture had happened, and we were still there. He then asked me if I was capable of driving their car. Considering we were all on a small car free island that did not seem particularly relevant at the time. I certainly did not know how to drive the boat. I remember his fear being particularly striking to me. I had not read the series past the first few pages because I did not like the writing style. But for him this was something real that was going to happen. The book was in someway prophetic. I could not understand that feeling. When I was about 10 I used to ask my mother a lot of questions about Revelations particularly about when Jesus was going to return to earth. After listening to all her answers it was very clear to me that guessing when wouldn’t help, and thinking that it would happen at a specific time, predicting its occurrence, was actually contradicting statements made in the bible. No one will know. It is interesting how long the end of the world has been predicted, how many people have thought they are living in the last generation, how their reasons for this belief are varied and different. That is what intrigues me. That we can never know, and as people of faith who are told we cannot know, yet people keep claiming this knowledge. The original Greek meaning of the word apocalypse is not necessarily even about the end. It focuses instead on the revelation of truth, the ripping of the veil, in other words a seemingly irreversible change. The world has had many of those. From the spreading of literacy to the invention of the car. Sometimes these changes are global, like the popularization of the internet. Sometimes they are more local. For the natives of North America the arrival of Europeans was certainly an apocalypse. So many people have survived an apocalypse (positive or negative) over the years, without an end of the world or a return of Christ occurring. The multiple narrators that exist in my chapbook survived an apocalypse, it was just not the biblical one. Because the changes they experience, like any other major changes, they inform who they are and how they live, and different individuals handle them in different ways. However as with all my narrative poems in this manuscript, each is told from the point of view of a different, imagined person. So even if a poem explicitly about an individuals faith was included it would probably not reflect my beliefs. For me the best writing on faith is not literal, it does not take the bible and re-tell it, instead it takes risks with biblical ideas. I am thinking now specifically of the Great Divorce, one of my favorite C.S. Lewis books. One that deals with all sorts of theological issues if you get down to it, from purgatory to judgement day. But C.S. Lewis does not preach to you. He is not trying to sell you that version of heaven. That is not the point, it is an exploration of ideas by an artist, by one man. Some people who read The Great Divorce take issue with it theologically. So even when I write more explicitly about faith, as I do in some of my rare personal poems, I feel nervous. I want to have the freedom to explore ideas about sin, about the intimacy of faith, etc, without fearing the picking apart of it. Whenever I write I am not telling the truth as I know it internally, as much as I try, I can’t. It is just a facsimile, an attempt. But still it is something I am trying to do more of. In December I prepared to submit to a favorite literary journal. One I have purchased on many occasions. One I was planning to buy a subscription to. However, they had a warning up that they would respond to all submissions slowly, outside of the official reading periods. The next one started January 1st. I decided to wait to submit. I went back today and found that they had added a two dollar fee. One dollar went straight to Submittable (their submission manager) and the other dollar went to them, but you received a one dollar off any of the products in their store. They do not pay their writers. They are a non-profit. They are using the money to keep operating. I wish they were getting their money from somewhere else. I paid the fee. At least I knew explicitly where the money went. And I was glad they were encouraging submitters to buy issues. However, it is part of a larger movement I am very leery of. In the last four years there has been shift toward charging writers rather than readers, because there are more people interested in submitting than in reading the publication. This is problematic on many levels. When I first started submitting I was lost and overwhelmed, but I found Duotrope, a great resource that contained data on thousands of literary journals. At the time Duotrope was free, but two years ago they started charging 5 dollars per month, or a flat rate per year. I reluctantly became a subscriber, because I already relied on them and regularly made the amount to cover the fee they charged from accepted submissions. However, for someone who never used it before, or rarely did, there is now a barrier up to using their services. Because they rely on user inputted data about response times and acceptance rates this affects the services they provide. I think that ultimately, particularly in this last year, Duotrope’s services has started to suffer from charging a fee. I think the results are skewed because the only users are those so committed to the service that they pay for it. When I first started submitting in 2011, I only encountered one journal that I wanted to submit to that had a fee. But it was a fee you only had to pay if you submitted online. Now many journals that do not have a postal submission option charge a fee. So that the only way you can submit is to pay that fee. Now not all writers have other jobs, or other jobs that pay well. So they really have to focus on using the money they have wisely. $5 dollars a month for Duotrope or $2 to $3 dollars for submitting to a literary journal does not sound like that much. But it can add up. On a busy year, I still usually manage to submit to 130 literary journals. If they all charged $3 dollars I would have to pay $390 dollars a year, plus my Duotrope fee ($50 dollars for a yearly subscription). It is highly unlikely that I would make that money back in payment from journals. Also, some journals do not offer contributor copies, and I always make sure that I have at least one copy of the journals that publish me. Being a writer that submits to and is published in literary journals is heading in the direction of becoming an expensive side project for a writer who, like most writers, really would prefer to just write. That isn’t even going into the submission fees for book contests and chapbook contests and all the other steps writers are often encouraged to take these days. I am someone who has an MFA, who has been a professor for a number of years, who writes professionally about literary journals, and who plans to have a book out some day. Having a good publishing record helps you get good teaching jobs, it helps you get a book published, and is something I plan to continue. In many ways, my career depends on it. However, the group of people who submit to literary journals is already not very diverse. It is mostly people who have undergraduate degrees in creative writing, MFAs or MAs. Part of what I do when I write about literary journals is encourage writers who do not have an academic background to submit to literary journals. However, if we continue to head in the direction where a submission fee is the standard instead of the exception, the writers who submit to and are accepted by literary journals will be even less diverse. Not only will they most likely be from an academic background, they will also need to have enough money to justify the process of submitting, which already takes a lot of time and energy. They will also most likely be writers whose careers depend on publication in such journals. I find this shift towards charging submission fees to be upsetting, but I think that the long terms effects could actually be devastating. Not necessarily in a personal way, that is less significant, but to the loose community of writers at large. Literary journals will no longer reflect the larger community of writers at all, but just those who can afford to pay, or those whose career relies on publication. I want young writers to be encouraged to submit. I want writers who are self taught, like Ray Bradbury was, to submit. Unfortunately this does not seem to be the direction literary journals are heading. Two reviews of my chapbook have been published recently. One by the wonderful poet Kelly Boyker was published in Menacing Hedge. The other is by Christopher Frost for Neon Magazine. I am afraid I do not know anything more about Christopher Frost than the bio he wrote below my review. However I am curious to read more of his work. Below is a short excerpt from the review. Thomson’s extraordinary poems explore the absence found in the in-between spaces, the moments between blinks, the slow seconds between heartbeats. Thomson’s delicate and clinical ear proceeds with lightest of touches and a subtle sense of fine-tuned emotion. She writes with deceptive simplicity – having excised all superficial flesh to reveal the essential skeletal framework of the natural world. Though there is a haunting sadness throughout the journey that Incident Reports represents, in the end we are left with a clean cauterized sense of despair and a hopeful glint of light and purpose. Or else there’s the long poem from which the collection takes its title. “Incident Reports: The Vanishing” is a stunningly novel piece which – through a variety of case files – charts the events that transpire when all at once, and for seemingly no reason, a huge chunk of the world’s population suddenly disappears. The skies fall dark. Washing up is left undone in the sink. Houses sit empty. Fires burn with no firefighters left to combat them. Melancholic as the poem is, it’s also incredibly beautiful. The same holds true for the majority of poems in this collection. Whether it’s the disappearance of the moon, or any number of smaller and more personal incidents, Thomson’s reports catalogue a series of apocalypses that are eminently worth exploring.